I slide on my barn boots and light fleece jacket as I get ready to do the morning chores. A cold breeze greets me as I open the door but I am cheered to see the rain from overnight had stopped. As I walk across the deck and down the stairs, I begin my usual scan of the land. 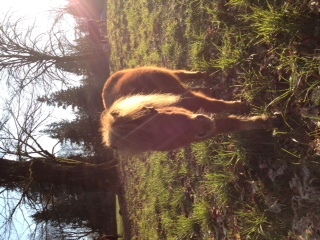 Up ahead in the paddock, I notice little Fable is lying down. Although it is not unusual for him to relax in this way, he is usually eager for breakfast—attentive to my movements with small nickers to let me know he loves his food. As I continue to walk towards him he gets up, walks a few steps and then lies down to roll. Ahhh, I thought, he must be suffering from a mild—and I surely hoped it was—case of colic. Colic is a generic term for stomach ache and its causes are many. Unfortunately, colic can also be a killer in horses. Last July was the first time Fable had a bout of this gaseous condition. It was very dramatic. I had never seen a miniature horse experience colic and it appeared as if Fable might die right in front of me. The vet was called and, to our relief, Fable finally passed through it. He has had other episodes since then as colic is a common ailments of miniature horses. They are plagued with an intestinal system that is made for a regular size horse but cramped into a little horse’s body. His tract has more sharp twists and turns then a Disneyland roller coaster. The result is, at best, constipation and gas and, at worse, death. I quickly feed the other horses so that I can give Fable my full attention. When I reach his paddock he is standing again, one leg cocked and his eyes are half closed, blinking slowly; his legs quivering. I quickly administer a dose of homeopathic remedy that I keep on sight and then watch as he lies down again in an attempt to ease the pain. His little body shivers more intensely now. I place my hand over his side and feel firecracker energy beneath it. Over the past year of helping Fable through these attacks, I have developed a system of care. Knowing that rolling can cause serious and sometimes fatal intestinal twists I first support his back with my knees as he lies on the ground. I place one hand on his shoulder and the other on his belly. I calm myself and breathe deeply while sending him love. I find this quiets him down and when the quivering stops I add the gentle flow of Tellington Touch—a technique for colic called “lick of the cows tongue”. Fable has responded well to this form of care in the past and was appearing to do so today. I hold him in my arms and my heart, as I allow the energy to flow through his body, healing his system. I talk to him while inviting him to breath with me through the pain. I then intuitively let my hand guide me to the spot where he finds the most relief. I keep looking up to the house hoping Steve will sense something is wrong and look out on the field. I wasn’t dressed for a long stay outside and I was getting cold. I knew not much more time would pass before I started getting chilled and then wouldn’t be any good for Fable. When Fable stands up again I take my chance and run for the house. I quickly tell Steve that Fable is colicking and that I really need a hot coffee while grabbing my hat and a warmer jacket. I am gone only minutes but Fable is down again, all four legs in the air. It appears as if the symptoms are worsening but something inside won’t let me believe it. As I get back to his side, he looks up at me and the relief in his eyes is palpable. I realized then that I hadn’t told him I where I was going. No one likes to be abandoned in their pain and, in my hurry, I had neglected to tell I would be back. He rolls on to his side again as I positioned myself behind him with my hands in place. I look into his eyes and speak soothingly. There is no denying the message I receive that he truly appreciating my presence. I continue to hold him and within minutes the feeling of his gurgling belly subsides and his muscles relax. He sits peacefully while I massage his lower back. Steve arrives with my coffee. I gratefully accept it while we both watch Fable get up and walk over to his feeding area like nothing has happened. Steve looks at me peculiarly. I cant help but feel defensive: “Didn’t you see him lying here from the window? Couldn’t you see him walking in circles and then rolling?” But it really didn’t matter. Fable’s system was relieved within the blink of an eye. My little buddy was back. Pure love…..